As royal newlyweds Prince Colwyn and Princess Lyssa, Ken Marshall and Lysette Anthony are at the heart of Columbia Pictures' Krull opened in 1983. Theatre for the past six years, is best known for her two starring roles in acclaimed British television versions of "Oliver Twist" and "Ivanhoe" - both nostalgic, if centuries apart - looks at English history. Each young star has other credits as well. Marshall, the Ohio-born son of a naval architect, has also appeared in Shakespeare festivals, a summer stock production of "Shenandoah" opposite Ed Ames, and as a guest-star in the highly acclaimed television production of "How the West Was Won." After co-starring opposite Anthony Hopkins in the 1979 Los Angeles production of "The Tempest," he returned to New York to fulfill a childhood ambition - the leading role of Tony in Jerome Robbins' Broadway revival of "West Side Story." On screen, Marshall has most recently starred opposite Burt Lancaster and Marcello Mastroianni in an Italian film, "La Pelle." British - born Lysette Anthony graduated just three years ago from convent school, but had already accumulated a year as a fashion model for famed photographer David Bailey before her acting career took off. In fact, the fledgling film star suddenly found herself so much in demand that she has shelved earlier plans to begin three years' study at London's fine Guildhall Drama School. Now that they have journeyed to the enchanted world of Krull Marshall and Anthony are firmly fixed on the future. 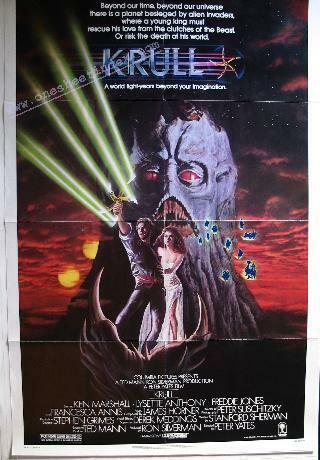 Columbia Pictures presents Krull starring Ken Marshall and Lysette Anthony. The Ted Mann-Ron Silverman Production of a Peter Yates Film also stars Freddie Jones and Francesca Annis. Silverman produced, Yates directed and it was written by Stanford Sherman. Mann was executive producer.